The Dangers of Valentine’s Day – when it’s not all roses and chocolate. Valentine’s Day is holiday that brings on a range of emotions, depending on who you talk to. We’ve talked about the pressures and stress that holidays bring on for couples, and “The Day of Love” is no exception. For some, Valentine’s Day is a happy day to look forward to. For others, Valentine’s Day is a source of anxiety caused by societal expectations. This holiday also causes many people dread, as it serves as a reminder of loneliness or loss. Regardless of your own feelings about it, the hype around Valentine’s Day makes it difficult to avoid. After all, heart-shaped candy, pink and red balloons, and giant teddy bears are hard to overlook! If you love the holiday, seeing these things can be exciting reminders of the season. For many people, both those who are single and those in relationships, these visual reminders can be awful triggers anxiety or loneliness. 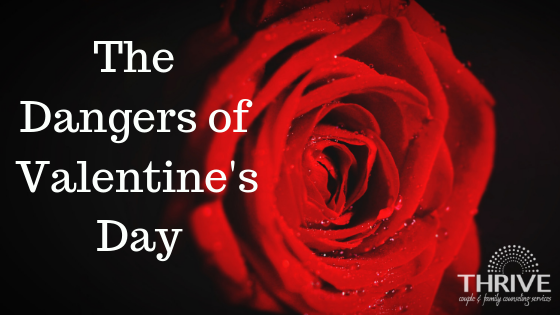 Whether you are a fan or not, there are some dangers of Valentine’s Day to note. Being able to recognize these dangers will help you face the day with awareness and health, regardless of your relationship status. When most people think of the kind of love that is celebrated on Valentine’s Day, they think of “romantic love.” Romantic love is the kind of love that is easy to see and is often expressed through big gestures and expressions. People who profit from Valentine’s Day tend to push this romantic love idea because it can be bought! Of course, romantic love is great. It’s nice to see our partners put in the effort to win us over with extravagant dates, love letters, or expensive gifts. But if that was all that love was, we would get bored pretty quickly. That’s because there is so many other types of love that should also be celebrated! In romantic relationships, there is a deeper, committed kind of love that is more special than romance, but it is harder to see. Commitment isn’t proven through one day of grand gestures. Rather, it’s proven over a lifetime of building trust, repairing mistakes, and being friends. Speaking of friendships, there are other kinds of relationships and love that Valentine’s Day can celebrate. February 14th can be used to remind other people in our life how much we love them. Our friends, family members, kids, and pets all need and deserve love, too! Adhering to a narrow definition of love on Valentine’s Day is dangerous because romance is not the only kind of love – it’s not even the most important! Fight this danger by remembering other expressions of love that are deeper; they don’t always have to take the shape of a romantic partner, either! Reflecting on other people who love you in different ways is a great way to celebrate the holiday of love. When you are expected to do something, it’s hard to do it authentically. 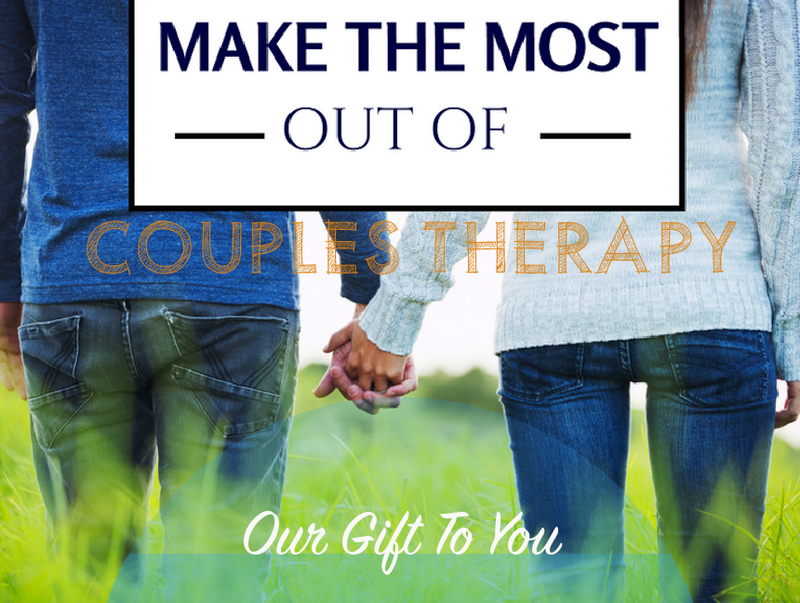 People are often frustrated with how to balance a desire to do “the right thing” for their loved one on Valentine’s Day, but also wanting to do things that are natural for them. Couples won’t always be in a place of closeness and connection just because it’s Valentine’s Day. If buying a giant box of chocolate and a bouquet of flowers doesn’t feel like an authentic thing to do, you don’t have to do it. It’s more important to express love in the way that you feel it, rather than doing something just to please someone else. We all have a desire to connect with the people we love, but if you don’t feel like you can authentically find that connection, that’s okay, too. It could be a better use of your day to do some self-care and love yourself if you aren’t in a good place with your partner. YOU are important! Alternatively, it could be a good use of time to have a conversation with your partner to explore why you aren’t feeling like you can express love in an authentic way. A therapist can help with this! Having a designated day to express your love for another person creates a lot of performance pressure. Many people report feeling weighed down by societal expectations to do or say certain things, just because it’s Valentine’s Day. The message that society sends about Valentine’s Day is that everyone should find a romantic connection with someone, and that this should be shown through gifts and food. However, not everyone wants to connect that way! The danger happens when we let that pressure get to us and we feel forced to do the “right thing” by feeding into this idea. Love isn’t a bad thing. In fact, it can be great! Having a day to celebrate love isn’t such a bad thing, in and of itself. The danger comes when the day is no longer about celebrating different kinds of love, but it becomes about doing or saying all of the “right” things. Keep your intentions in check by asking yourself why you’re doing the things you’re doing. If making a restaurant reservation at a place you can’t afford is causing you more stress than relief, you don’t have to do it. Take the pressure off by evaluating if you’re doing things because you feel like you “have to” or if you’re doing it because you want to. On any given day, it is easy to compare yourself to those around you (especially when engaging in social media!). Valentine’s Day can make this comparison game even worse. It’s easy to see how this comparison can lead to negative thoughts about your own predicament, partner, or holiday. Remember that people have very different backgrounds, and we rarely know the whole story about someone else’s life. Staying focused on your own experience of the holiday is helpful to combat the urge to compare yourself to another person or another relationship. One person’s card may be more meaningful than a box of a thousand chocolates, even though the chocolates are easier to see and boast about. If you are in a relationship, do you know how your partner feels about Valentine’s Day? Assumptions about how your partner experiences Valentine’s Day can be dangerous. As it was mentioned earlier, some people celebrate Valentine’s Day because it makes them happy! They look forward to having a day dedicated to letting others know how much they are loved. On the other hand, some people avoid the holiday because it brings up uncomfortable feelings or reminders for them. They’d prefer not to celebrate it. It’s crazy to think about how many people might not ever explore his or her partner’s feelings about Valentine’s Day! There could be unnecessary pressure that could easily be addressed through a conversation and clarity. When deciding if you will celebrate the holiday or not, talk to your partner about what matters to them. Make sure you both understand the other’s meaning behind the holiday and how they prefer to celebrate (or not celebrate). 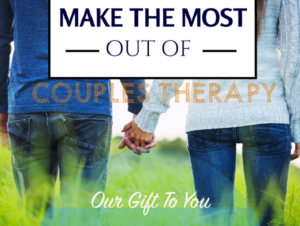 This post was written by our talented Denver Tech Center couples therapist Emma Abel. I love this article. It is such a pressure on that day! I used to fall in to the trap of feeling lonely when the day didn’t go as planned. Now I make my own plan and make sure to take in to consideration all types of love and make It a less selfish day and more about others.